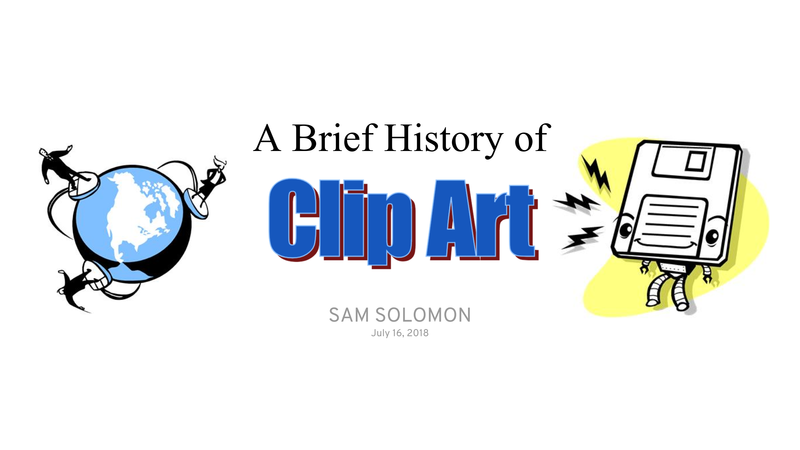 This talk covering the history of clip art was originally given on July 16, 2018 at SalesLoft. This article is an adaptation of my presentation. If you were in school during the 90s or early 2000s, you’re familiar with the fun, quirky graphics that came bundled with Microsoft Office. That’s right. I’m talking about clip art! Whenever you had a presentation or book report due, clip art was an easy way to add a bit of flair. Then again, this was before most people had internet in their homes. Before we get into the history of clip art, I should clarify what this post is about. Clip art refers to pre-made graphics that can come in various forms. Most people are familiar with the whimsical 90s artwork that shipped with Microsoft Word. However, clip art can come in both digital and print form. Note that clip art only refers graphics and illustrations. Stock photography is not a form of clip art. Often these images have licensing restrictions attached to them. Before personal computers, clip art was widely used in the publishing industry. It was closely associated with the mechanical paste-up process for laying out pages. Paste-up involved a production artist siting at a drafting table and laying out an entire page by hand. Paragraphs were often printed together, but headlines and other unique elements required hand-setting. This was tedious and involved close attention to detail. The document’s kerning (the space between letters) and leading (the space between lines) were measured with a ruler. A completed, camera-ready page was referred to as a mechanical. Graphics added to pages would be “clipped” out. Then the artwork would be attached to the mechanical with rubber cement or another semi-permanent adhesive. Finally, the mechanical was photographed to create a negative for each printing plate. Most publishers would move away from mechanical paste-up by the early 1990s. Desktop publishing software such as Adobe Indesign or QuarkXPress made print design much less tedious. Fewer people could also layout a page in much less time. ExecuVision may be the most spectacularly named piece of software in history. I love how the name oozes with that 80s corporate vibe. ExecuVision must be the future! Produced by VCN, ExecuVision was among the first commercially available presentation software. The software was designed for the IBM PC and shipped with the first library of professionally drawn clip art. Additional clip art could be loaded onto the software from separate floppy disks. At the time each additional disk cost about $90 or $225 today. MacPaint is notable in the history of clip art because it provided an easy way to create it. This increase in artists built a demand for visual assets. These were pre-build designs artists could take and manipulate to create new artwork. MacPaint required an Apple Macintosh, which was prohibitively expensive for most consumers. However, the computer found success in the desktop publishing and education markets. Anybody with MacPaint could produce, sell and use bit-mapped clip art for the first time. This would lead to an entire industry of business build around creating and selling digital clip art. This includes early notable pioneers such as the T/Maker Company and Compuset. In 1986 Adobe introduced Illustrator for the Macintosh. Illustrator is notable as it introduced vector-based graphics editing. Previously clip art came in a bitmap or rasterized format. Bitmap images are created from a large grid of multi-color pixels. This would lead to degraded quality at larger sizes. On the other hand vector artwork uses geometric data to determine how shapes are drawn. This allows the graphics to be scaled as large as needed without loss of quality. In the 1990s CD-ROMs began to replace floppy disks as a way to install software on personal computers. CDs could hold hundreds of times more data than floppy disks. They became common distribution channel clip art. However, the increase in storage had some interesting effects on the industry. In the days of floppy disks, companies focused on producing a few high-quality sets with a certain stylized look. That changed with the introduction of CDs. During this time companies began to market quantity of illustrations over their quality. Having a library of images for every occasion became a more valuable proposition than a few well-crafted ones. In the mid-90s Microsoft began bundling clip art with several products—most notably the 1996 release of Microsoft Word 6.0. This version of Word came bundled with 82 different clip art graphics—free for anyone who purchased Word. The growth of the internet further diversified the distribution model for clip art. As opposed to buying CDs filled with images, large searchable libraries begin to appear online. Most notably iclipart.com and graphicsfactory.com, which were among the first online libraries. Internet libraries provided two other licensing options. Purchase a single license or pay for a subscription. A subscription would give them unlimited access to the entire library of images. While these online publishers began to disrupt existing distribution channels for clip art. Online publishers had their own competition. It wasn’t long before free clip art libraries began appearing. On December 1, 2014 Microsoft published a short blog post announcing that it was closing the Office.com Clip Art Library. Instead it would refer users to Bing’s Creative Commons search filter. Bing Image Search uses a copyright filter based on the Creative Commons licensing system. The results that are returned are images that have been tagged with Creative Commons licenses. A link to the source of the image is provided, which you should use to review the source of the image and the applicable license to determine whether your use will comply with the license. (The settings can be switched to show all web results to view more images.) However, you are responsible for respecting others’ rights, including copyright. Clip art was weird. Inconsistent art styles were cobbled together. However, it retains a certain nostalgia and reminds me of my time spent on the internet as a kid. Perhaps, Megan Garber’s eulogy to clip art best describes the impact the art form had on the web. This is a eulogy—for a form of artistic expression that added wonder and whimsy to the words of a youthful Internet. Clip art may have been clumsy and weird; it was also earnest, and full of the possibilities that came with our newfound capabilities as publishers and creators and communicators. But was this really the death of clip art? Perhaps, children will no longer use the quirky illustrations in their school papers, but the medium all is not lost. There are plenty of communities where creatives create and share their work. Creative Market and various stock photography sites carry vector illustrations for sale. And if you’re looking for the quirky, less buttoned up clip art of your childhood communities such as openclipart.org are alive and well. Make no mistake. The death of clip art has been greatly exaggerated. Clip art used in this presentation is from openclipart.org. As a graphic designer who first came in contact with clip art in 1985 with CorelDraw, I find it rather strange that CorelDraw was not even mentioned. CorelDraw shipped with a ton of floppy disks containing clip art and fonts, and was probably more wide spread than the Adobe products from the same era. For example, CorelDraw was the dominant software in the signage industry, and Corel was at the time probably the only DTP Programm that could „talk“ to plotters. Actually, “clip art” goes back many centuries. Manuscript illuminators used hand-drawn reference books in the 12th-14th century that illustrated the form and anatomy of religious iconography like lambs, lions, doves, etc., as well as things like… God, Jesus, John the Babtist, St. Catherine and the instruments of her torture, and so on. These were copied verbatim into the marginalia of books and manuscripts before the advent of Gutenberg’s press. In the 15th-17th century, artist’s studios all had collections of drawn figure studies, nature studies and vanishing point perspective studies (a new thing) that the artist and his assistants used for designing and composing paintings, frescos and murals. As the technical development of woodcuts and engravings allowed prints to become art forms in and of themselves, and to be widely reproduced and disseminated throughout Europe, they were collected by other artists to use as reference for their own works. That was also clip art. A drawing of a three-quarter view of a horse in a contapposto pose, by an unknown 13th c. Italian artist (currently in the Royal Collection at Chatsworth or Christ Church — I don’t recall which) was so ideally considered that it was copied literally thousands of times in drawings, prints and paintings throughout Northern and Southern Europe over several centuries. 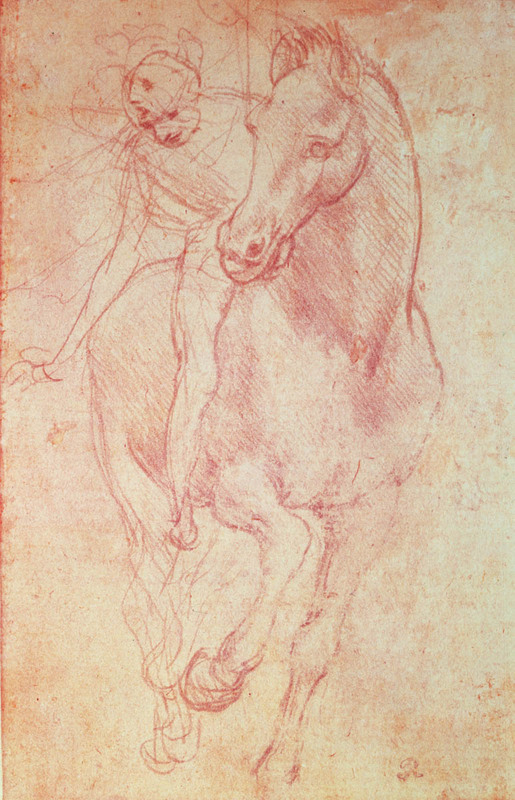 Here’s an exact copy of it by Leonardo (http://shows.we-envision.com/aa/2big/LEONARDO%20da%20Vinci/b49499.jpg). That was clip art, and it was royalty-free. In the 18th-19th century, a widely published series of books in England illustrated a world of objects, patterns, decorative borders, etc. that artists and book publishers could copy and reproduce. Many of these found their way into the 20th century series of clip art books by Dover Publications (http://store.doverpublications.com/by-subject-art-dover-design-library.html).